Recipes for Immortality. Healing, Religion, and Community in South India, Richard S Weiss, 2009, New York, Oxford University Press. Despite the global spread of Western medical practice, traditional doctors still thrive in the modern world. 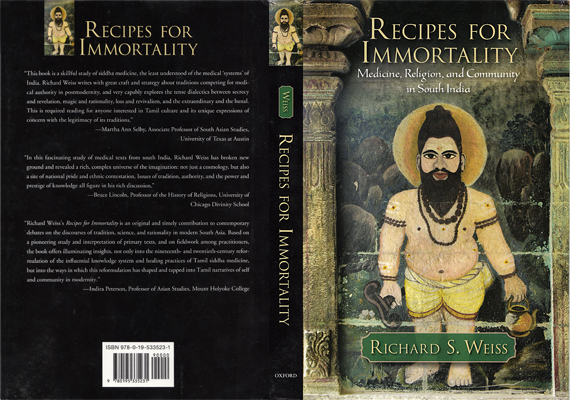 In Recipes for Immorality , Richard Weiss illuminates their continued success by examining the ways in which siddha medical practitioners in Tamil South India win the trust and patronage of patients. While biomedicine might alleviate a patient's physical distress, siddha doctors offer their clientele much more: affiliation to a timeless and pure community, the fantasy of a Tamil utopia, and even the prospect of immortality. They speak of a golden age of Tamil civilization and of traditional medicine, drawing on broader revivalist formulations of a pure and ancient Tamil community. Weiss analyzes the success of siddha doctors, focusing on how they have successfully garnered authority and credibility. While shedding light on their lives, vocations, and aspirations, Weiss also documents the challenges that siddha doctors face in the modern world, both from a biomedical system that claims universal efficacy, and also from the rival traditional medicine, ayurveda, which is promoted as the national medicine of an autonomous Indian state. Drawing on ethnographic data; premodern Tamil texts on medicine, alchemy, and yoga; government archival resources; college textbooks; and popular literature on siddha medicine and on the siddhar yogis, he presents an in-depth study of this traditional system of knowledge, which serves the medical needs of millions of Indians. Weiss concludes with a look at traditional medicine at large, and demonstrates that siddha doctors, despite resent trends toward globalization and biomedicine, reflect the wider political and religious dimensions of medical discourse in our modern world. 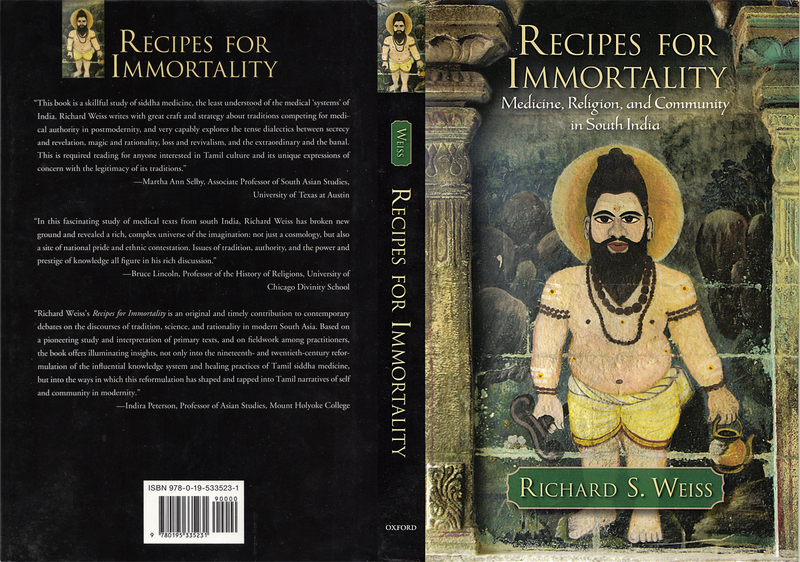 Recipes for Immortality proves that medical authority is based not only on physical effectiveness, but also on imaginative processes that relate to personal and social identities, conceptions of history, secrecy, loss, and utopian promise.